Hall of the Mountain King: Review: Texas Hippie Coalition, "Peacemaker"
If somewhere in the Lone Star State there were a city where Pantera Boulevard crossed Skynyrd Street, at that intersection, you’d probably find the world headquarters of Texas Hippie Coalition. The band describes itself as Red Dirt Metal, and it’s as good a description as any. Like the bands that are often identified as part of the red dirt movement, THC has elements of southern rock, country and other genres, but they also add a bit of extreme to the mix, drawing on the power grooves of Pantera, the heavy rock of Black Label Society and even the occasional modern metal influence. On their third album, Peacemaker, THC brings it all together in, perhaps, the most potent mix of songs they’ve put together so far. 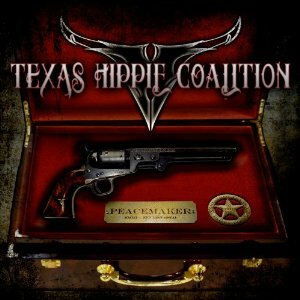 For a perfect encapsulation of what Texas Hippie Coalition is all about, skip to the third track, “8 Seconds.” It opens with a stomping Southern boogie, then you get singer Big Dad Ritch’s distinctive roar, delivering the braggadocio and cockiness that mark most of his lyrics with a rodeo theme that ties things back to their Texas roots. That attitude goes right into next track, “Outlaw.” The current trend in country music these days makes me skeptical about songs where people proclaim themselves outlaws, but for a groove as mean as the one guitarist Randy Cooper delivers on this song, I’ll always make an exception. The band delivers a nice mix of those grooving, outright Southern numbers and heavy slabs of pure metal. “Damn You to Hell” might be the band’s heaviest song to date, playing far more to the Pantera end of the spectrum, but it’s still a great tune with a huge hook. One of my favorite songs on the record, “Wicked,” also leans more toward the heavy end with a great power riff and a chorus that’s been stuck in my head since the first time I heard it. They can break it down and go straight for the traditional sounds, too, as on the opening of “Paw Paw Hill,” which starts pretty much as a country number until, on Ritch’s cue of screaming “rock ‘n’ roll,” the band breaks out the heavy guitars and slamming drums. I almost think the country part doesn’t last quite long enough, though there’s nothing slouchy about the heavy part, either. And being a Louisiana boy, I always appreciate a reference to Marie Laveau, and the nod to Waylon Jennings and “The Dukes of Hazzard” in the lyrics is a nice touch, too. "Don’t Come Lookin’” hits the modern Lynyrd Skynyrd sound and continues the outlaw theme as it tells the tale of a man on the run telling giving the woman back home advice on how to handle things when the police come around. “Peacemaker,” a song told as you might expect from the point of view of the gun, has a bit more of a wild west feel and a lyrical nod to Steppenwolf as Ritch roars out the line “goddamn the pusher man.” It’s not as strong as some of the other tracks, but still solid. The only song on the record that just really doesn’t work for me is album closer “Think of Me,” a big ‘80s-style ballad – what Ritch calls a “heart song” – that’s not necessarily a bad tune, but seems very out of place given the crass bravado of the rest of the record. It’s hard for me to picture the same guy who was bragging in “8 Seconds” that he’s “the bull that can’t be rode, an animal that won’t do as he’s told” baring his emotions to someone he loves. Maybe it’s just me, but I’d like this record to go out on a big, ballsy track. But there’s plenty of that to be found elsewhere, in fact it’s in pretty much every other song on Peacemaker. The album is a testosterone-drenched, raging slab of badassery from start to nearly finish, all delivered in a Southern drawl that sets Texas Hippie Coalition apart from pretty much anyone else on the metal scene right now. It’s heavy as hell, but doesn’t sacrifice melody or groove to get there, and these days, that’s a rare and beautiful thing.